The former Rotunda Amusement Park, typical of seaside towns from Blackpool to Coney Island, is the inspiration for Richard Wilson’s 18 Holes. The dysfunctional and long overgrown crazy golf course was the only remnant of the otherwise erased park. Wilson’s herculean project of cutting, lifting, restoring and reassembling the eighteen weighty concrete slabs is a tribute to the memory of this former popular tourist attraction. 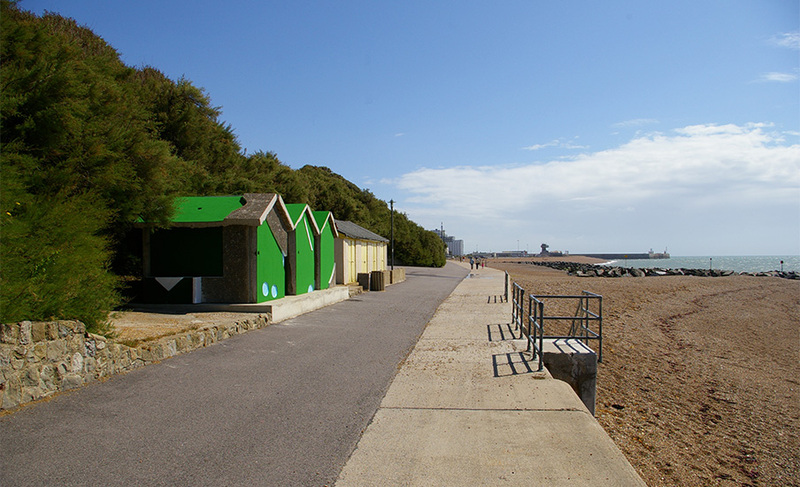 Wilson’s three ‘crazy’ beach huts are installed only a few hundred metres away from their original site and alongside the existing rather bunker-like Folkestonian beach huts. Richard Wilson, 18 Holes, 2008, part of Folkestone Artworks collection, commissioned by Creative Foundation. Images by Martin Wills.